How Can a Valium Overdose Treatment Center Help Me? If you or a loved one is recovering from Valium overdose or addiction, it is important to consider seeking treatment at a qualified center. A Valium overdose can be serious, and whether an overdose is intentional or unintentional, it could signal underlying emotional or mental health issues. The drug works by increasing the effects of GABA in the brain. GABA, or gamma-aminobutyric acid, is a neurotransmitter in the brain that helps calm the nervous system. By increasing the effects of GABA, Valium helps a person going through extreme anxiety feel calm and much more relaxed. Valium is a very addictive drug, thanks to its hypnotic, sedative effects. It’s common for someone taking the drug to develop anxiety issues and start to yearn for the euphoria and extreme sense of calm that they experience as they take it. People taking Valium can quickly develop a tolerance for the drug and will soon need more of it in order to get the desired effects. That tolerance can lead to dependence and then addiction. Doctors usually don’t prescribe Valium for long-term use, so if patients want to continue enjoying the effects of the drug, they’ll find other ways to obtain it. You can see how simple it is to leap from taking Valium as prescribed to abusing it. What’s worse is that the withdrawal symptoms that come from stopping Valium suddenly are extremely unpleasant and include things like shallow breathing, respiratory distress, numbness and increased anxiety.2 The abuser takes more Valium in order to eliminate these symptoms. Left unchecked, the Valium addict ends up taking more and more of the drug with each use. People who abuse Valium also tend to take it with alcohol to increase its effect, and this is where the risks of overdose really come into play. 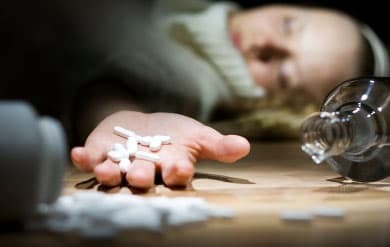 Symptoms of an overdose include a clumsy, drunk-like appearance, slowed reflexes and extreme drowsiness.3 People who have taken too much Valium along with alcohol can slip into comas. A Valium overdose can severely depress a person’s respiratory system, so making sure the person is breathing properly and receiving enough air is the top priority. Obtain immediate emergency medical assistance if someone is exhibiting signs of Valium overdose. The person should be kept awake until help arrives. If you feel like you need to speak with someone immediately, call 911. Choose a center that fully explains the detox process so you know exactly what will be happening to you as the Valium is removed from your system. You’ll want to choose a Valium overdose treatment center that knows how to keep you as comfortable as possible as you detox. Choose a center that will help you identify and treat the underlying psychological, emotional and mental issues that are related to your addiction. Choose a center that is staffed by experienced and dedicated medical doctors, nurses and staff who care about their patients. Choose a center that cares about what happens to you after you leave. The most challenging part of recovering from Valium overdose is the period of time that takes place after you leave the center. Whether you’re doing it for yourself or a loved one, recovering from Valium overdose is serious business, and you’ve made an admirable first step. When you’re ready, pick up the phone and speak to a caring staff member at 1-888-319-2606 Who Answers? .
. National Institute on Drug Abuse (2012). Well-known mechanism underlies benzodiazapines’ addictive properties. National Institute of Health: The Science of Drug Abuse and Addiction. Retrieved from: https://www.drugabuse.gov/news-events/nida-notes/2012/04/well-known-mechanism-underlies-benzodiazepines-addictive-properties.
. National Institute on Drug Abuse. Diagnosis & treatment of drug abuse in family practice. National Institute of Health: The Science of Drug Abuse and Addiction. Retrieved from: http://archives.drugabuse.gov/diagnosis-treatment/diagnosis6.html.
. National Institute of Health (2016). Diazepam overdose. National Institute of Health: U.S. National Library of Medicine. Retrieved from: https://www.nlm.nih.gov/medlineplus/ency/article/002629.htm.